A panoramic, supernatural impartation of the piercing and painful issues that challenge many faithful Christians and the Church in these End Times. Here you will find a fresh perspetive on suffering and healing, endurance in the face of great adversity, the lost and forgotten and why Heaven is seemingly so quiet and absent as hell wreaks havoc on the lives of Christians everywhere. Insightful, honest and fearless. Through these pages find insight and wisdom and gain fresh understanding and strength. In Visions From Heaven, Wendy Alec, prophet and seer, recounts a series of extraordinary supernatural encounters with the Father following a season of deep, personal trauma. In a series of panoramic visions, the Father and Jesus take Wendy on an extraordinary journey. If you have been through a season of adversity and testing and found yourself at the sheer rock face, encountering some of the fiercest trials and testing of your life... if your heart is secretly breaking with bewilderment and abandonment... if Heaven itself has seemed silent... so, so very silent at your time of deepest need... the Father's answers to these questions will bring surprise, challenge, immense encouragement and such great hope. 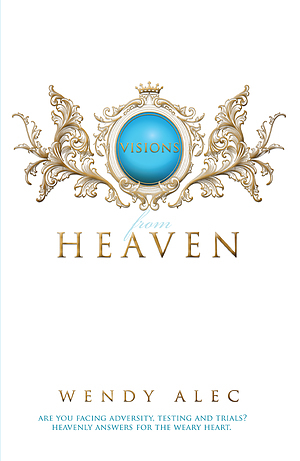 Visions From Heaven by Wendy Alec was published by Warboys Publishing in February 2014 and is our 8113th best seller. The ISBN for Visions From Heaven is 9780957149885. This is a profoundly touching book,which is a true account of a dear woman of God and her experiences after having undergone traumatic loss of both her life as she knew it and ministry,due to a horrific debilitating illness.It tells of her great struggle,feelings of abandonment and despair,followed by her long deliverance from the sifting of the enemy into the father's very throne room.During which,she experienced healing of her wounded heart in a most personal and spectacular way.You will be deeply ministered to,challenged and ultimately filled with comfort and assurance,both of the father's immense love for his children and with regards to the days that lie ahead.Get a copy,read it and pass it on as fast as you can.It is a very important testimony in these days and to those who feel they have failed around you,it may well be the most powerful lifeline to the one who loves them that you could ever put in their hands. Got a question? No problem! Just click here to ask us about Visions From Heaven. Wendy Alec's powerful book, Visions from Heaven: Visitations to My Father's Chamber, is the story of redemption and restoration out of Wendy's excruciating physical and emotional pain. Visions from Heaven offers a lifeline to those drowning in a sea of hopelessness and depression. If you or someone you love is questioning God in the midst of a trial, this book will be a beacon of hope in an ocean of despair. I highly recommend this book! Like Wendy, I have suffered much on so many occasions. I too have been told there is no hope just like Wendy was. There in the valley of the shadow of death with no real answers. With no real answer from the Church and with no instant healing and total despair. Wendy does not descend further into the mire of total despair. She was low, so low and there already. She ascends to the highest heavens and there she sits with our Lord, the Creator of the universe. There she tells a story like no other I have ever heard; there she takes you, the reader, to the heavens with her. This is a book like no other, whatever your despair. As you go with Wendy into this inspirational, prophetic book, you to will enter into the heavens. You, too, like me in the middle of the war in Baghdad, can move into the throne room of the Almighty and, like Wendy, see the glory of the Lord and find His healing, His wholeness and His love. This book is a must. Wendy Alec has done it again! Rarely do we find such a combination of scriptural content, prophetic edge, and poetic capacity in writing converged in one person to create a work of art. In Visions from Heaven: Visitations to My Father's Chamber, we have a book that is inspirational and yet solid as a rock! Read and be touched by Our Father in Jesus' name!